Based in Plymouth and founded in 1982, St Luke's Hospice provides the best possible care to more than 3,500 patients, facing the reality of a life-limiting illness, each year across Plymouth, South West Devon and East Cornwall. This incorporates practical, financial, emotional and spiritual support, in addition to medical and nursing care. Patients can receive this care as an outpatient, by visiting the Day Hospice or by a stay at the Hospice, which normally lasts between one and two weeks. The majority of these stays are for those looking to have their symptoms controlled so they can return home to a higher quality of life. The organisation has grown from a small, seven-bedded unit in Plymstock to a purpose built 20-bed inpatient unit at Turnchapel, with a Day Hospice at Pearn and a variety of specialist community services. These include a Specialist Palliative Care Team on the wards of Plymouth's Derriford Hospital and Community Nurse Specialists who provide care for people in their own homes. In communication terms St Luke's Hospice was utilising two completely separate telephone systems. 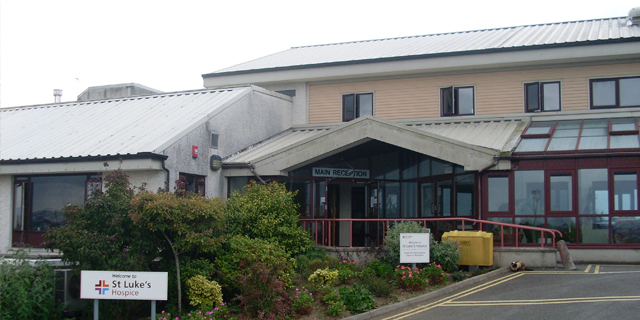 Around 80 extensions at the main Turnchapel site had been driven by the same Panasonic system for well over ten years, whilst Community Services at Pearn relied on some 50 Mitel IP handsets operating as extensions hanging-off the main NHS system at Derriford Hospital and running over a 100Mbps circuit. As St Lukes' IT Manager, Andrew Sims, explained, "Staff and volunteers could make and receive phone calls and transfer them internally - but that was about it. Calls between Turnchapel and Pearn had to be routed over the PSTN, which incurred call charges, the link between Pearn and Derriford Hospital would dropout several times a week and we'd receive cross-charges for the calls we made out on the Mitel system. In addition, Panasonic had just made the system we were using obsolete. Replacement parts could be sourced but they were "second user" - sourced from equipment that had been removed from service and that was on the shelf. At the final count, we had 35 different types of handset in use, whilst 6 different internal phone lists existed, all in paper format. It certainly wasn't the most efficient way to communicate, from either a user or administration perspective." 'We initially rolled out some 15 IP handsets in the new Distribution Centre. This not only gave us the opportunity to work closely with both SpliceCom partner Three Cherries and the manufacturer themselves, but also gave some of our staff the chance to use the system before we made the final decision at our other two sites. Once the feedback from the staff proved positive we put the business case before the Senior Management Team and so, when finances allowed us to do so, we extended the system by installing two more SpliceCom Call Servers at both the Hospice in Turnchapel and our Pearn site,' continued Andrew. Since September 2012, St Luke's Hospice has been running a single Maximiser OS system across all three of its sites, with each one running its own local Call Server. This greatly simplifies overall management of the system as changes can be made from anywhere via a standard web browser, with modifications made to one Call Server being automatically replicated on the other two. St Luke's Hospice has also deployed SpliceCom's modular Vision Business Management System. This currently provides historical call management information and reporting with integrated call recording, again accessible from anywhere via a standard web browser. The flexibility of the system allows real-time wallboard and/or call centre modules to be easily added in the future should they be required. St. Luke's Hospice has been caring for thousands of terminally ill patients, across Plymouth, South West Devon and East Cornwall, 24 hours a day, 7 days a week for the past 30 years. Like many similar organisations the Hospice has grown from small beginnings to the position they find themselves in today; a major organisation spread across three major sites, running 34 separate charity shops.